Now you too can have a lusher, greener lawn that will be the envy of your neighborhood. Grow plumper, tastier tomatoes. Sweeter and juicier melons. Bigger roses. Healthier shrubs. Lovelier houseplants, too! Best of all you can achieve these results  without a "green thumb" or back-breaking toil  with our extraordinary NUTRI-20 formula. Download our directions for application. One look at it and you see its total difference from ordinary, granular fertilizers. These are bulky with inactive ingredients, smelly, and slow in nutrient release. But Nutri-20 gives you a 20-0-20 formula lawn and plant food. Every element is "unlocked", ready to aid grass, plants, trees, etc., the instant applied. Nutri-20 now contains carboxylic acid which helps unlock naturally occurring phosphorous in soils that your lawn can use. An even more environmentally friendly way to delivery the essential elements your lawn needs. FASTER ACTING: Nutri-20's unlocked elements dissolve in water. Roots...tissues...leaves...can thereby receive needed nourishment in less than ONE hour. 60 minutes! Dissolve as little as 1 teaspoon of concentrated Nutri-20 per gallon of water. Or use even more water! Fast, liquid feeding and Nutri-20's (20-0-20) formula provides nourishment on contact- comparable to a "pickup" to a person who is tired and hungry. You see prompt improvement toward rich, healthy growth and beauty. Prompt application of Nutri-20 can save plants from death due to "root rot". Because even if roots or your plants are damaged - even if diseased - Nutri-20 can supply needed food elements through the foliage and branches, till roots recover. Nutri-20 can save you hundreds of dollars by eliminating shrub and lawn losses. Plants Must be Liquid Fed! NUTRI-20 is 100% Water Soluble - Supplies Food through Liquid Feeding. You know that plants need water constantly. But did you ever wonder why? A main reason is that plants can use vital food ONLY after these are dissolved in water. Yes, dry fertilizers are useless until dissolved. So why apply an incomplete fertilizer that can burn or cause other damage? Apply safe Nutri-20 dissolved in water, and its vital food elements are ready to help your plants instantly, on contact. We Get Love Letters..."Concrete Evidence about NUTRI-20 for Zoysia Grass Lawns!" "...used the Nutri-20 on the new plugs in order to give them a better start. This was three weeks ago. These plugs have now begun to show some new green shoots. What is most amazing however, is the surrounding grass in which these plugs were placed and which also received a dose of Nutri-20. There is now concrete evidence of the efficiency of Nutri-20. This grass is of a decidedly deeper shade of green than the grass near it, and I have never seen grass so lush. It is a beautiful carpet of deep emerald green." tells you everything you need to know right on the back label. When and how to feed using a sprinkling can, hose sprayer, pressure type sprayer. How to get great results on houseplants, dormant plants, transplants, and of course lawns, especially zoysia grass lawns. 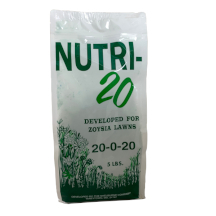 Nutri-20 is guaranteed to work wonders in lawn, flower, and plant growth. Gives new vitality and beauty in days - or money back! FOR YOUR LAWNS...Nutri-20 will make them greener, richer, healthier. FOR YOUR FLOWERS, PLANTS...Nutri-20 will create many more blooms that last longer. Brilliant color you dream about. Fruits and vegetables will be juicier, better tasting, plumper. FOR YOUR SHRUBS...Nutri-20 will bring you finer foliage, richer color, sturdier growth - all year 'round. Order larger packages and save! You must be delighted with Nutri-20 in every way. Otherwise return unused portion within 30 days, and your money will be refunded in full. No questions asked.